A custom pressure transducer is a transducer that converts pressure into an analog electrical signal, often manufactured with the exact specifications required for an application. As a pressure transducer manufacturer, OMEGA has developed a modular transducer system that allows customers to quickly and easily build a custom transducer. A custom designed assembly area and automatic test and calibration system avoid the long delays typically found in ordering a custom transducer. Delivery times under 1-week are common with our system and quality is 100%. Each transducer is supplied with a 5-point NIST traceable calibration certificate done at time of shipping. What is a custom pressure transducer? How long does it take to manufacture the custom transducer? Is there a premium price for the custom pressure transducer? How can I specify and order a custom transducer? Omega's MM Series custom pressure transducers combine the flexibility of over 1-million possible combinations with fast delivery. They are built around Omega's new revolutionary state of the art piezoresistive silicone technology. A full wheatstone bridge is diffused into a silicon wafer and then micro-machined to exacting standards to produce a silicon sensor that has excellent stability, linearity, and long term stability. The silicon wafer is diced into individual silicon sensors which are then mounted into a core module, a thin layer of oil and a stainless steel diaphragm isolates the silicon from the process media. This core module is available in gage pressure (relative) or absolute pressure. The modules are run through an automated test system (ATS) which sets linearity, and thermal coefficients for each module. The sensor core is combined with electronics and a transducer assembled into a fully welded stainless steel case and fully tested before delivery. Our target is to be able to deliver up to 10 of any configured model in 10 days or less. Depending on the quantity and the specifics of the design, typical delivery for a custom transducer is one to two weeks. In a push we can deliver it even sooner, same day or next day for small quantities. Gage, Sealed Gage, Absolute, Compound Gage, Barometric, Vacuum and wet-dry or wet-wet Differential pressure. Pressure ranges can be scaled for virtually any units with ranges as low as 10 inches of water up to 5,000 psi. Typical units available include psi, bar, mbar, kPa, inH2O, ftH2O, inHg plus the Barometric ranges are available in hPa or mmHg or other specified units. Current, 4-20 or 0-20 mA are common but customer ranges are also available; 0-5 or 0-10 Voltage and 3 or 10 mV/V outputs are most popular plus any range within those ranges. Select the accuracy that best fits your application with industrial accuracies from 0.4% and 0.2% down to laboratory grade accuracies of 0.05% and 0.03%. Trim pots are available as an option so the transducer can be dialed in to exactly match a customers needs. More than a dozen process fittings are available to connect the transducer easily to any process. Both Imperial (American) and metric fittings are available plus several sanitary and clean in place (CIP) fittings. Choose from several different temperature compensation ranges. Temperature compensation ranges from industrial grade of 20 to 140*F to premium grade -40 to 220*F plus special aerospace ranges up to -60 to 260*F.
Because of the extreme stability of the silicon core, thermal accuracies are specified across the compensated range. Standard thermal accuracy is 0.5% with a premium grade of 0.3%. Available with cable, cable with conduit fitting, twist lock connector, mini-DIN, and pins with glass-to-metal seals terminations. The twist lock connector and pin terminations are available in hermetically sealed versions for the highest environmental protection. A host of other options are available including various agency listings and, shunt cals, potentiometers and custom calibrations. In the future, materials other than Stainless steel will also be available. There is a fixed price schedule for all of the configurations. Some of the selections carry additional charges, and are noted at the time of choice. The modularity of the Omega Silicon Transducer system allows us to offer over 1 million possible combinations quickly and with no set-up charges or premiums for fast delivery. 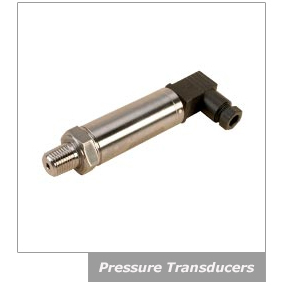 Use our Pressure Transducer Configurator to specify your exact transducer. The Configurator will guide you through the process of specifying a transducer. Typically the process will take less than a few minutes to complete. At the end the process the Configurator will provide a part number, price and delivery time for the transducer. You can then order online or contact any of our sales agents to place an order. The Configurator is easy to use and allows you to experiment with various options. You do no not have to log in or provide personal information in order to use it, and no commitment to purchase.